By buying this product you'll earn up to 235 Rewards points. This Niles current-sensing 12-volt trigger lets you automatically turn on a secondary device when you power up the first. For example, activate a motorized projection screen when you turn on your front projector. Plug the Niles trigger into an AC outlet, and connect your projector to the trigger's AC input. Then run a mono minijack cable (not included) from the Niles trigger to your screen's 12-volt trigger input. Fire up your projector, and the screen extends — you're ready for movie night. Note: Due to the CS12V's current limitations, we recommend not using high-current components like most home theater receivers and amplifiers as the triggering device. Works great !! Does what its supposed to . Turns on a Niles FM-1 Cooling fan unit. Overview: The CS12V is a current sensing 12-volt (DC) trigger. Plug one of your system components into the 3-prong AC outlet and the CS12V senses the current draw when that component is turned on, and energizes the 12-volt output to turn on a second component. 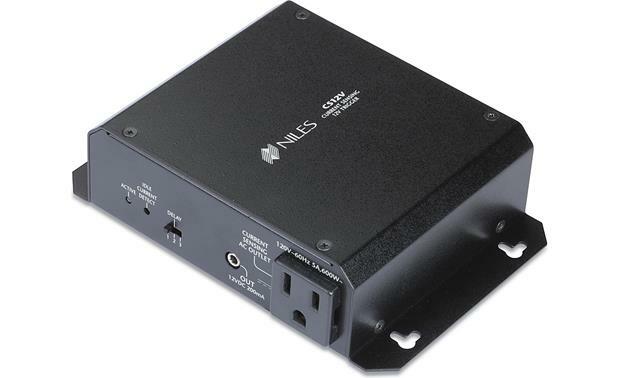 Note: According to Niles Audio, the power consumption on the component plugged into this unit must be at least 30 watts to trigger the 12 volt output. Delay: You can delay the 12-volt output when the connected component is turned on. The delay time options are zero seconds, five seconds, and 10 seconds. Idle Current: Most components draw some nominal current when they're off. With the connected component turned off, set the CS12V to account for that current. Searches related to the Niles CS12V Current-sensing 12-volt trigger.